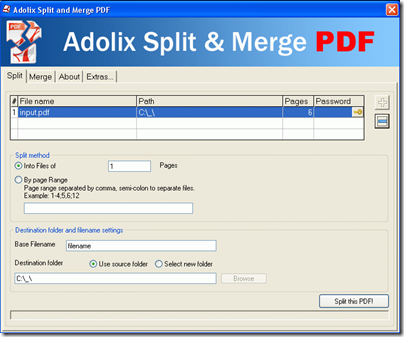 Earlier we had covered on combining or merging multiple PDF files, today we came across another tool called Adolix Split and Merge PDF. This is free utility that you can use to combine / merge or split PDF files. We have lot of PDF files in my computer and it makes lot of sense to combine similar PDF files into a single PDF file to reduce file clutter. Also many times we end up downloading PDF files from the Internet and require only few pages out of them. So from now on we can extract only the relevant part of the PDF files that we require. 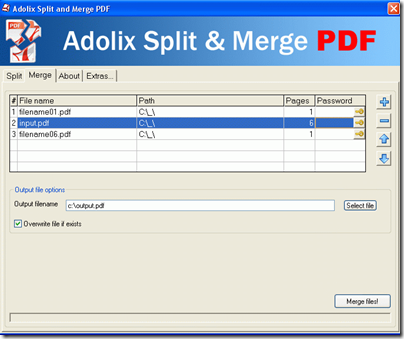 Adolix Split & Merge PDF can merge / combine multiple PDF files into a single PDF file, also it can split a single PDF file into multiple PDF files. To split a PDF file there two options available in this software: split into files by ‘n’ pages and split into files by ’1 to n’ page ranges. To split a PDF file all you have to do is select the PDF file that you would like to split and choose the split method, then rest would be taken care by the utility. To merge the PDF files add all the files that you intend to combine and hit the Merge Files button, all the PDF files will get merged and a single PDF file would be found in the output directory. 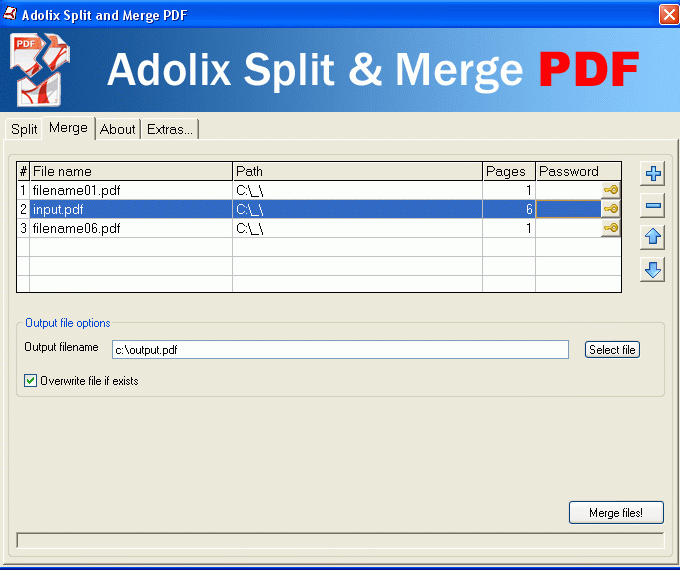 One feature that sets is apart from PDFMerge Utility is that Adolix Split & Merge PDF can handle password protected PDF files which the PDFMerge could not do.